Charlottesville, VA – Chats of the far-right groups that descended on Charlottesville last weekend have been leaked to us by an anonymous source. The organizers and groups attending had been communicating using Discord, a gamer chat platform, to plan logistics for Saturday’s white supremacist rally, as well as the torchlit march that ended in an attack on UVA students the night before. They also continued using the platform after the weekend ended in the death of Heather Heyer. On the Charlottesville #UniteTheRight Discord server, members ranging from “Baked Alaska” (Tim “Treadstone” Gionet) and neo-nazi DailyStormer editor Andrew Anglin, to members of bigotry-advocating groups such as Identity Europa, American Vanguard and other neo-nazis, shared disturbing and violent imagery mocking those injured and killed in the car attack against anti-fascist counter-protesters. The following video highlights some of the racist and very disturbing content, coordination and egging-on which transpired on the main Charlottesville Discord server (Content advisory for racist language and graphic images). On the Discord server, far-right militants also discussed bringing more guns to their next rally, blamed the local police and government for being “communist”, discussed doxing anti-fascist protesters they’re targeting, stated they see recent events as the beginning of civil war they want to start, and speculated how if Lauren Southern showed up they would fight amongst each other to claim her as their “war bride”. As Monday’s crackdown on neofascist accounts among various Internet platform providers unfolded, the company operating the Discord service canceled the Discord server linked to white supremacist Richard Spencer’s altright.com and related accounts for ToS violations (Terms of Service). 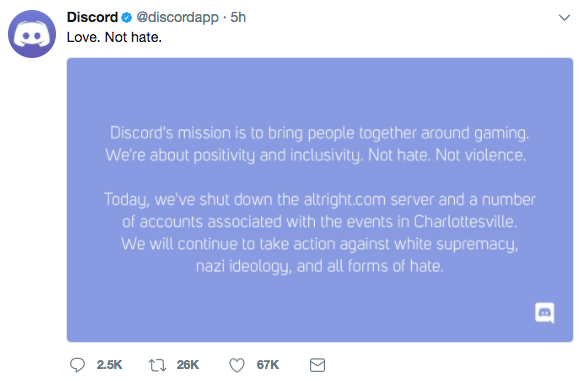 Discord service provider announced Monday it is cancelling far-right and neo-nazi-promoting chat servers and accounts. 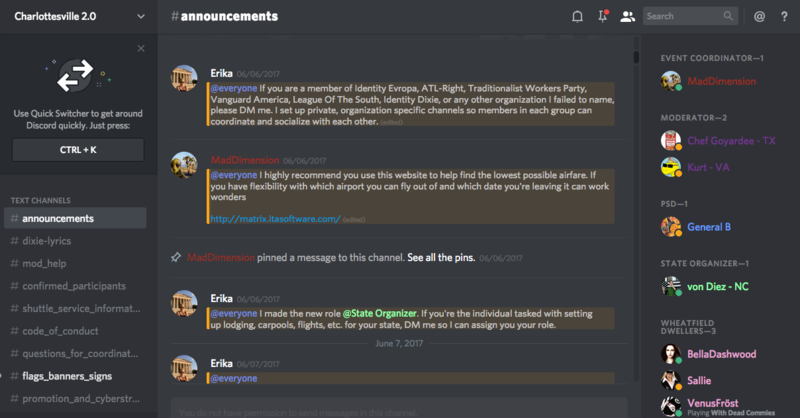 After the ‘Charlottesville 2.0’ Discord server disappeared, worried far-right would-be militants started exchanging more contact information with each other and accusing prominent figures in their movement of being ‘shills’ who helped ‘set up’ Charlottesville. Some far-right server administrators said they would fall back onto TeamSpeak servers, which are not controlled by a central vendor and thus harder to cancel en masse. In the last 48 hours some groups often seen at far-right rallies have been distancing themselves from exposed violent racists, and Internet accounts have been getting cancelled by service providers. The GoDaddy hosting service announced that DailyStormer.com would be removed within 24 hours for violating ToS. The fascists switched their domain registration briefly to Google Domains but it was cancelled again within hours, Ars Technica reported. Today the “Three Percenter” militia-type organization have announced they are “standing down” from any further participation with rallies involving neonazis and white nationalists. “Three Percenters” armed with semiautomatic weapons formed a major security cordon for far right groups in Charlottesville. Stay tuned for additional upcoming reports on leaked #UniteTheRight planning materials. * 9:40CDT Monday clarification on Discord servers: “Other leaks Unicorn Riot obtained indicate they were a principal component of the general far-right attack coordination in Charlottesville.” More reports to come.